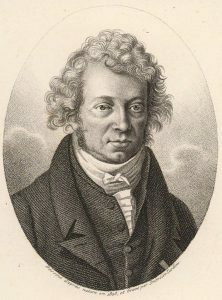 Engraving of André-Marie Ampère in 1825 (age 50). June 10 marks the passing of Andre-Marie Ampere. Ampere was a French mathematician and physicist who is considered the father of the study of electrodynamics. Prior to Ampere, the study of electricity had nothing to do with magnetism. They were considered two separate fields of interest. After seeing a demonstration of Hans Christian Ørsted’s experiment showing the needle of a compass would move if a current passed nearby. Ampere expanded this experiment using two parallel wires carrying a current. The wires would either attract or repel depending on the direction of the current flow. If both wires carried current in the same direction as each other, the wires would attract each other. If the current is reversed, the wires would repel each other. If the wires were charged, but no current flow, the wires would neither attract or repel. He mathematically expressed the relationship between magnetic field strength and current density now known as Ampere’s Law. This was the formal beginning of the science of electrodynamics. Ampere also theorized there was a basic electrodynamic particle or molecule that carried electrical charge and magnetism. This line of thought would eventually lead to the discovery of the electron. The SI unit of current, the Ampere, is named in his honor.